As the name suggests, the Cavalier King Charles Spaniel proudly traces its ancestry back to the royal courts of England. King Charles II, was devoted to his dogs - almost to the point of addiction. They travelled with him everywhere and the sign ‘Beware of the Dog’ originated in his court, meaning not that they were dangerous, but rather don't tread on them. Contrary to popular belief they do not have free access to all royal parks, palaces and public buildings in England - they just behave as if they do! Cavaliers can live up to 13 years of age, but, more often than not, will live up to 15 years if cared for with the correct nutrition and given lots of loving attention. The female is normally 5.4kg and 30cm tall when in peak condition, while the male should be 8kg and 33cm tall. 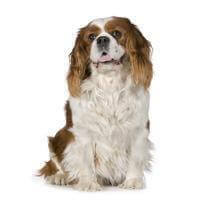 Energetic and loving, the Cavalier King Charles Spaniel makes the perfect family pet, but it must be stressed they are dogs that belong with people. They are not dogs to be left alone or housed outside as they thrive on human contact. BLENHEIM: Chestnut markings on a pearly white coat. The markings on the head should be equally divided giving a masked effect and leaving room in the middle for the prized ‘Blenheim Spot’. TRI-COLOUR: A black and white dog with tan markings over the eyes, on the cheeks, inside the legs, behind the elbows and on the underside of the tail. BLACK AND TAN: Absolutely raven black coat with tan markings over the eyes, on the cheeks, inside the legs, behind the elbows and under the tail. RUBY: Whole colour rich red with no white markings at all. Apart from all their excellent qualities, they do shed their coat twice a year and have poor road sense, so outside the well-fenced family property they should always be kept on a lead. If you are contemplating buying a Cavalier make certain that your fences are secure as puppies are apt to dig when young, and will find a way out of their yard if it is at all possible. Annual checks and vaccinations are essential, as is regular worming. Your vet will explain the dangers of heartworm and advise on the preventative measures. It should be noted that certain weeds and grasses might have adverse affects too. Regular grooming is necessary to remove excess hair and prevent the coat from matting. Suited to family circumstances or for retired people. These dogs will return years of loving pleasure. They are excellent with children and the aged. They are family dogs and to exclude them from close human contact will break their hearts.